Most of us view math as a neutral subject. Neutral means indifferent or “not engaged on either side; not aligned with a political or ideological grouping.” We regard math as a subject “not engaged” and “not aligned” with either biblical or worldly thinking. Believing that math is independent from God, we approach math as a “safe” subject—a subject we can all see the same way, regardless of our religious beliefs. After all, the equation one plus one equals two (“1 + 1 = 2”) works the same way for a Christian, Muslim, Buddhist, Hindu, or atheist. Math is a subject of numbers and facts, and most of us think facts are neutral. But is math really indifferent and neutral? Is such a thing even possible? The Bible warns us that we are in spiritual warfare (Ephesians 6:10-18). It urges us to guard our heart and to test the spirit behind what we are taught (1 John 4:1; Proverbs 4:23). The Bible does not mention any neutral ground. According to the Bible, nothing can really be neutral. Everything will be presented in either a biblical or a worldly fashion. 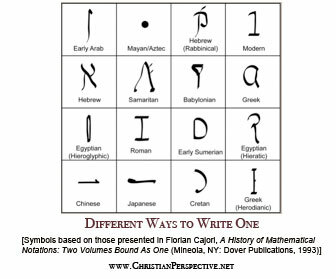 So how can math be presented biblically? What does God have to do with math? Join me now in looking at an equation we are all familiar with: “1 + 1 = 2.” We will examine where this equation came from and why it works. As we examine this equation’s origins and ability to work, we will discover some startling truths applicable to every area of math. 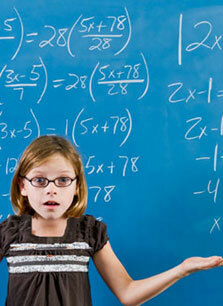 How can math be taught biblically? Find out in this short ﻿video, and sign up for ​our math emails. Mathematicians throughout history have developed various theories to explain the origin and consistency of addition. Some have speculated that addition exists by sheer chance. Others have claimed man created addition and addition works because man designed it to work. Most modern textbooks do not even attempt to offer an explanation for addition’s existence. Throughout my schooling, not one of my textbooks ever explained where addition originated or why it works. I eventually came to the conclusion that addition, along with all other math facts, is an eternal, self-existent truth. The Bible gives us a radically different explanation for addition. 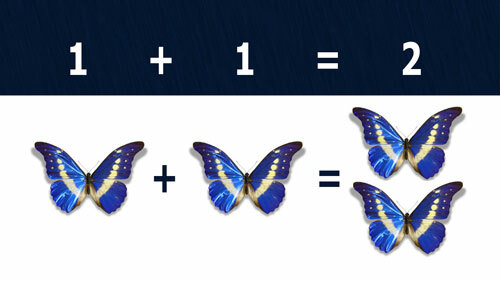 While the Bible does not specifically say, “This is where addition came from and why it works,” the Bible offers us principles that apply to addition, as well as to every other aspect of math. Look at what just two Bible verses reveal. Where Did Addition Come From? The verse “For by him all things were created” (Colossians 1:16 NIV’84) tells us where addition originated. It tells us God created all things. The word all includes everything, even math. This does not mean God created the symbols 1 and 2. Man developed those symbols. But those symbols represent a real-life principle called addition that is embedded in everything around us—a principle God created. Let me briefly illustrate. We have often taken an object, added another object to it, and been left with two objects (such as when we took one cookie and one piece of pie and ended up eating two desserts). It does not matter what we attempt to add, objects objects add predictably. An accountant adds dollars, a baker adds doughnuts, a retailer adds inventory, and an electrician adds wattage. Yet addition works the same way for all of these people. Why? Because all things add in a regular, precise manner. We refer to this regularity as the addition principle. Man has developed different ways to express on paper this consistency God placed around us. Throughout history, cultures have used different symbols to represent quantities. For instance, the Romans used Roman numerals (I, V, X, etc.) instead of our current Arabic system (1, 5, 10, etc.). However, man has never created anything in math. He has merely developed different symbols and systems to represent the orderly way things add. Addition originated with God. Now that we know where addition originated, let us look at why addition works. We will find the answer in the very next verse of Colossians, which reads, “In him all things hold together” (Colossians 1:17 NIV’84). Since the word all includes addition, God not only created addition but also continually holds addition together. How does God hold addition together? As we saw above, addition is a name for the predictable way objects combine. God holds addition together by keeping objects combining consistently. why addition works (God faithfully sustains the universe). The principles we have discovered about the addition equation “1 + 1 = 2” apply to the rest of math. Like addition, all of math is a way of recording and expressing the laws and relationships God created. Math works because God faithfully holds everything in place. Math is not independent from God. It is not neutral. Math’s very existence and ability to work is dependent on God’s faithfulness in holding everything together! God’s faithfulness not only makes math useful to us, but it also communicates an important message. The Bible tells us that God chose to establish a covenant with the “fixed laws” of heaven and earth (which would include mathematical laws like addition). His faithfulness in keeping His covenant with these laws demonstrates the same faithfulness He will show in His covenant of redemption. If I have not established my covenant with day and night and the fixed laws of heaven and earth, then I will reject the descendants of Jacob and David my servant. The way God holds everything together according to fixed laws demonstrates that He is a covenant-keeping God. His consistency in keeping one plus one equaling two serves as a continual testimony to us of His loyalty, faithfulness, and loving kindness. Math is really a testimony to God’s faithfulness and power. Math should continually remind us of God’s consistency and trustworthiness. After all, one plus one consistently equals two because an awesome, never-changing God created and sustains all things. Just looking at a sunflower, we can tell that the sunflower was carefully designed by a wise Creator. Math, however, allows us to see God’s design at a new level, revealing the care God took with each aspect of His creation. 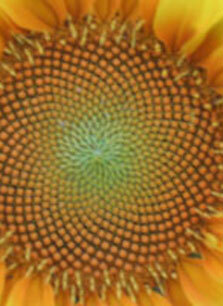 The seeds in all sunflowers–be they large or small–are arranged according to two patterns. When we use math to examine these patterns, we observe that, regardless of how many seeds the sunflower contains, the number of seeds will be distributed between the two patterns in approximately the same mathematical proportion–a proportion that enables sunflowers to hold the maximum number of seeds and reproduce quite efficiently! What a wise, caring Creator we serve! Seeing the amazing way God designed the sunflowers should remind us that we can trust Him to take care of the details of our lives. As we understand biblically where math came from and why it works so consistently, we find that God is not only in math, but He created and sustains math. Instead of setting God aside when we approach math, let us set aside our old ideas about math and approach math expecting it to glorify the Lord. Adapted from Beyond Numbers: A Practical Guide to Teaching Math Biblically. 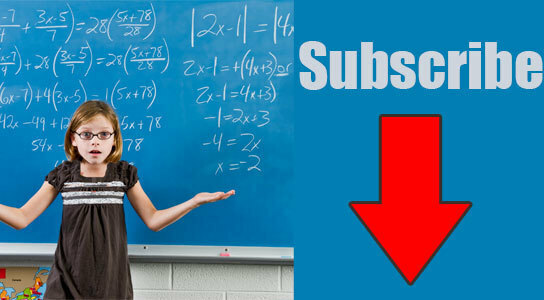 Subscribe to our Biblical Math Blogs; we'll also send you a free Transforming Math video!